The year’s activities have been intentionally slowed down at Bulbmeister.COM, but, nature, it seems, “decided” to make things go even slower in the months of September and October. The rain seemed never to cease, making it difficult to even mow, much less prepare the nursery for winter time or dig bulbs for customers. Well, what a refreshing November we are receiving so far! Temperatures have been warmer, and we’ve had mostly sunny weather all month. Now, it is time to get settled in for the winter. Last orders for immediate shipment will be accepted through the end of the month, although the list remains open through the winter, with products being shipped in the spring. I have started what should be the final mowing of the property for the season, and now is probably a good time for me to bring in bulb pots for winter protection. If I’m lucky (that really translates to “industrious"), I will finish the winter greenhouse and get started on my non-business related apple orchard deer fence. The fall foliage this year was at it’s best, and I plan to upload some images of autumn to my business page on Facebook. These particular images will not necessarily be flower bulb related, but I’ve already posted to that page some beautiful images of Lycoris in bloom. I would be honored if you would visit the page and even become a fan if you, too, are a Facebook user. Now is a good time to finish up fertilization and mulching of flower bulb beds for the winter. I will be trying out a brand new product, FreezePruf, this winter to see how it protects my fall foliage Lycoris. Reportedly, it is supposed to protect foliage by a differential up to 9.4°F. In other words, if your foliage normally gets damaged at 30°F, the applied product may keep your foliage from freezing all the way down to 21°F. I’ll try to report on it this spring. Additionally, this summer, late, deer started foraging heavily in my nursery, chewing Crinum and Hemerocallis, among other categories, down to the nub. I ordered a product called Deer Scram which claimed to repel deer and rabbits for up to two months. I’m very happy to report the product lasted at least six weeks, keeping the deer away, even through several rains. It’s a 100% natural, organic product, but a bit expensive in my budget. With that in mind, it’s active ingredients being dried blood, garlic, white pepper, and cloves, I’m going to try some experiments next season and see if I can’t make my own for much less. That said, I am very pleased with the product and it’s claims. As a final note, if I don’t post again before then, I want to wish everybody in the U.S. a very Happy Thanksgiving! May you be blessed with family, friends, and/or your favorite things and activities surrounding you. A visitor inquired about a good source for learning the basics of plant breeding. Since I could not think of a popular book right off of the top of my head, I did an internet search and found a site sponsored by the University of Illinois that should provide all the basics one might need for learning the art of plant breeding. This season has been great for Lycoris breeding evaluation. Bloom was especially good this year with all my spring foliage species and hybrids, I have selected over 60 plants for further evaluations and use as breeding stock. All selections are from established plots and mainly show species variation with some natural crosses that would have occurred before I acquired the stock. These will be dug, hopefully this week, and either given special plots or potted until a suitable site can be established. Additionally a number of primary and cultivar crosses were performed, making for the second year of organized effort in developing new hybrids. Seed stalks have been harvested and will be allowed to fully mature in the packing room. The seed will then be harvested and immediately planted. So, how does one properly germinate a shiny, black, round Lycoris seed? Sow immediately after harvest (if the seed coat starts looking dull, germination becomes more difficult). Prepare a seedling flat or pot with seedling medium or standard potting soil. Alternatively, prepare a seed bed in a location that is shady and protected from above ground and underground rodents; a cold frame with wire mesh barriers 4-6″ under the ground, for example. Wet the medium thoroughly then press the seeds into the medium, but only enough to stabilize the seed in the location; do not bury in the medium. I do successfully use 1/4″ of granite grit over the top of this setup with excellent success because it helps with moisture control. If using pots or flats, provide a “terrarium” environment making into a mini greenhouse. This can be done with clear plastic storage bags and even cling wraps. Sometimes a support might be required using bent wire to make mini hoops. Open ground will need regular light moisture. With the seed flat/pot setup, watering should only be necessary minimally through the fall and winter. If condensation quits developing on the surface of the clear plastic, it is too dry. If the Lycoris seed you are planting is fully hardy in your area, additional protection should not be required, but I like to have a location that can be kept above freezing. This will be a necessity for fall foliage Lycoris. Finally, as an emphasis to point 2, KEEP POTTED SEEDS OUT OF DIRECT SUNLIGHT. Leaving them in direct sunlight will create a little stove that cooks the seeds. All viable Lycoris seed will send down a root within a few weeks after planting. Fall foliage Lycoris may get a single leaf at this time, too. Spring foliage seedlings will only send up a leaf the following spring. Once the seedlings have gone through a foliage “cycle", they can be treated like other Lycoris, but, being young, it is especially helpful to avoid hot/cold extremes and protect from rodent damage. It can take anywhere from 3-5 years, under ideal conditions, to see a seedling flower. Afternoon shade is always a good thing. So, my Lycoris plots have been the bulk of my focus this season, besides trying to spend more time with my family. I expect to be digging and replanting a number of flower bulb species and varieties by the end of October, which could bring on a special sale from Bulbmeister.COM. Current customers and notification requesters will be alerted if the opportunity arises. What's In A Blog, Anyway? Here, I went and set up a blog and did very little to get things going. Now that the season is slowing, I decided to drop by and write a word or two. Just who do I think I am!? This has been a pivotal year for Bulbmeister.COM in that I had to make the difficult decision to discontinue the importation of flower bulbs to concentrate on developing the flower bulb nursery. The primary reason for the decision is strictly related to economics especially as affected by the falling value of the U.S. dollar. Additionally, I’ve not been actively marketing, simply handling orders as they come in and “strategizing” as to how I want to further develop the nursery. I’m seriously contemplating a significant dig in October for the purpose of reestablishing plots at better plant spacings. If this is done, there will be a significant discount on related items in a special sale. Although it was supposed to be this spring, I now plan to add inventory to my nursery sales list by next spring, so keep your eyes open. Please take note of the photograph when reading the explanations. For so many years, now, I’ve been interested in the combined art and science of plant breeding. I have also been encouraged by the fact that one does not have to be a great scientist to participate in what is also art. This short essay is simply given to show the potential results one can come up with when manipulating genes in flower bulbs. No, I did not design a new variety, here. This example is based on work by nature and others. When taking the pollen from one parent (male donor) and dusting it onto the stigma of the other parent (female, seed donor), if these plants are related and/or compatible can serve to make progeny that have qualities from both parents. This process, naturally, can become very complicated and convoluted, depending on the history of one or both parents. The first representative is always the female, and concerning the progeny L. xHaywardii, we can assume for now that the cross could be switched to get a similar result. Sometimes maternal genes can have some influence on the results, but I don’t know if that is the case here. Finally, enters “D", L. ‘Flaming Dragon’. This is a hybrid of unknown (by me) origins, but I would like for you to note the strong similarities it shares with L. xHaywardii, except in richness of color. I introduce this beautiful specimen mainly to speculate on possibilities. Not knowing its actual genetic makeup, I could easily surmise it is the result of a similar cross, or possibly a crossing back to one of the parents. How could it be a similar cross with colors so rich? 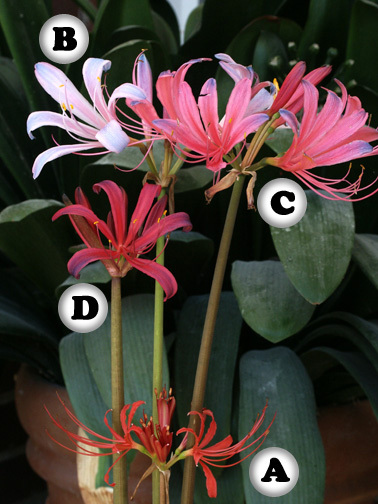 Well, I am only speculating, but, when I look at Lycoris radiata var. pumila, I see much consistency in morphology. L. sprengeri, on the other hand can have varying richness in pinks and/or blue tepal (petal) tips from one plant to another in a population. Do you have flower bulbs in the garden? Why not do a little dab here and a little daub there? Wait for the seed to ripen, plant it, and see what you get. If you have two species, all the babies will be the same (assuming bees or other pollinators didn’t help you out). If one or two varieties is involved, LOOK OUT! Every baby will be different. If you don’t have the time to study up on all the do’s and don’t’s related to plant breeding, try to remember the basic rule of thumb to cross kind with kind; Lilies with Lilies, Daylilies with Daylilies, etc. However you choose to go about it, be patient, because seeds take time to ripen and seedlings take anywhere from 1-3 years to reach flowering size, but I’ll GUARANTEE YOU that you will experience the excitement you did as a child when finding something new and previously undiscovered. This blog is actually a very special blog! It automatically aggregates all posts from all other blogs allowing you to easily track everything that is posted on this system.